Il magazine Eventi Culturali ha dedicato un ampio servizio a Irial e alla sua fondatrice Iris Tiberio. In particolare, oltre alla presentazione dell’azienda e ai diversi settori in cui opera, l’articolo racconta la genesi e le caratteristiche del nuovo canale online Irial Home catalogue. 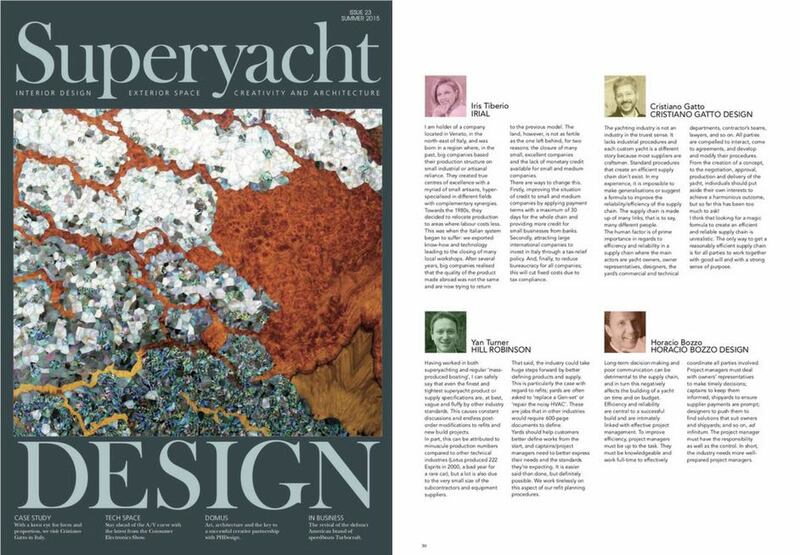 The Superyacht Design magazine presents a series of refined, quality surfaces and finishes. Irial etchings offer a modern interpretation of this ancient art form, creating aluminium surfaces with a wide range of glossy and satin finishes. 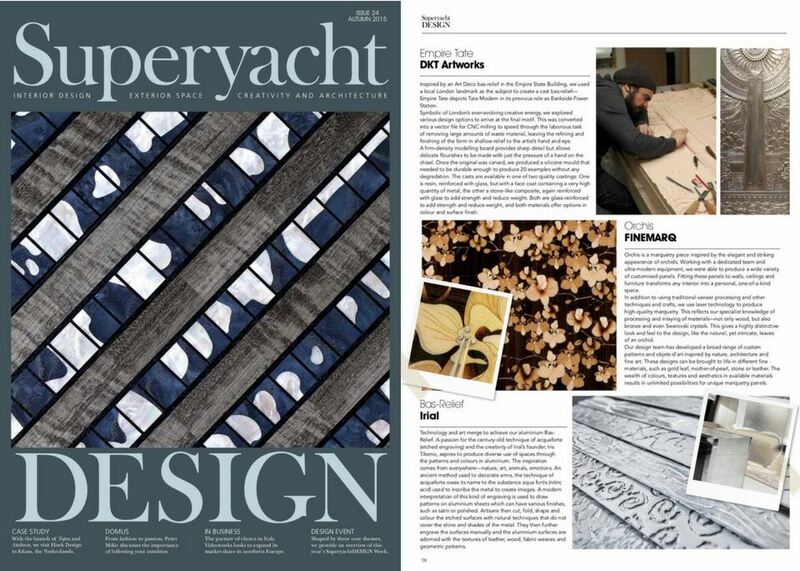 Superyacht Design magazine dedicates an in-depth article to the superyacht situation in Italy, discussing production and efficiency problems in the logistics chain. Iris Tiberio, the founder of Irial, was interviewed as part of the panel discussion with entrepreneurs and managers. 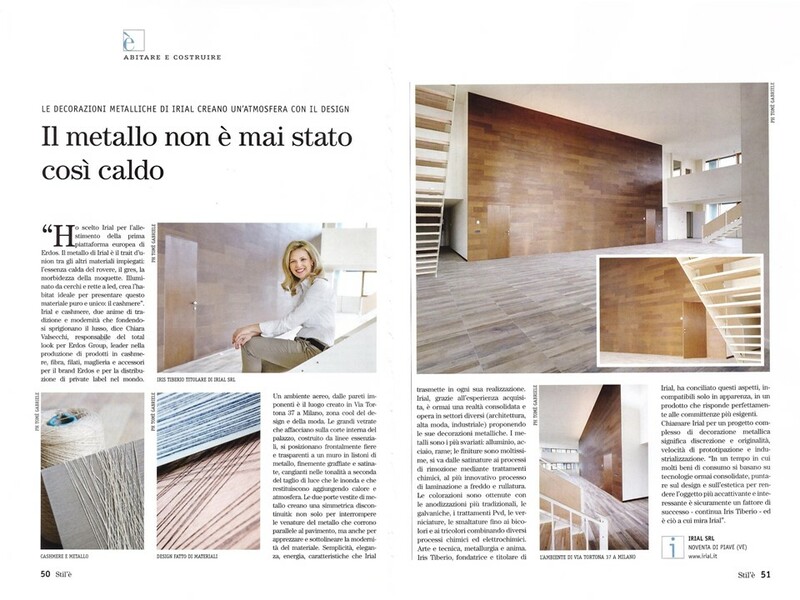 Stil’è magazine by Il Sole 24 Ore is once again talking about Irial surfaces on the occasion of the launch of the first European platform by the Erdos Group in Milan. Chiara Valsecchi, the total look manager for Erdos, explains: “Irial and cashmere, two symbols of tradition and modernity that combine to create luxury”. 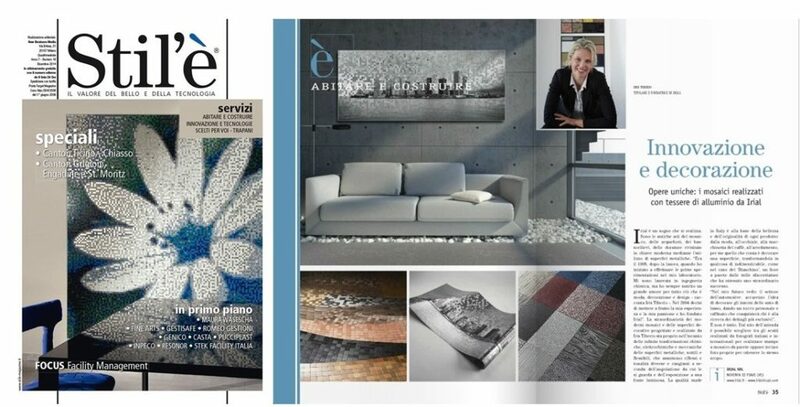 Stil’è magazine by Il Sole 24 Ore dedicated an article with numerous photographs to our mosaics entitled “Innovation and Decoration”. The article tells about the founding and development of this art, that has allowed the company to transform an ancient technique into a modern design product. 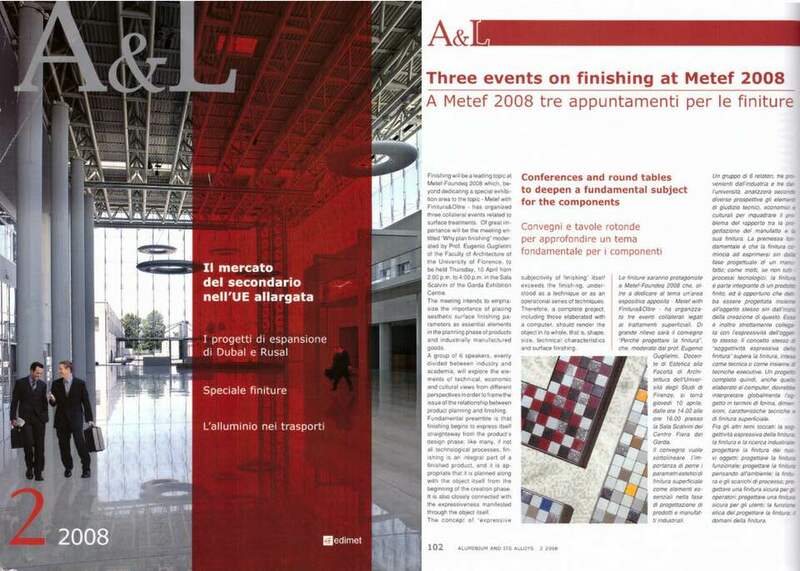 The magazine A&L – Alluminio e Leghe published an in-depth article about Metef-Foundeq 2008, which in addition to the exhibition area also dedicated three events to finishes and the importance of superficial treatments. 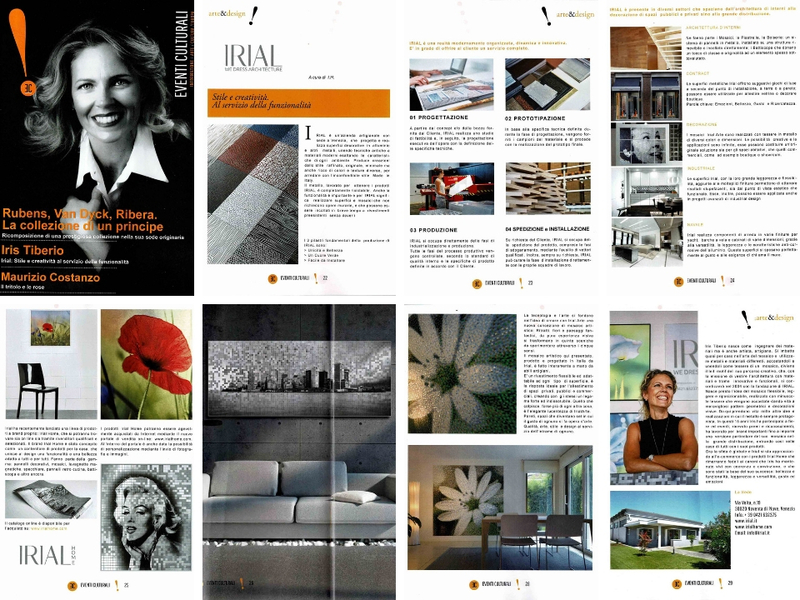 Irial is present among the protagonists of the event representing finishes made in Italy. 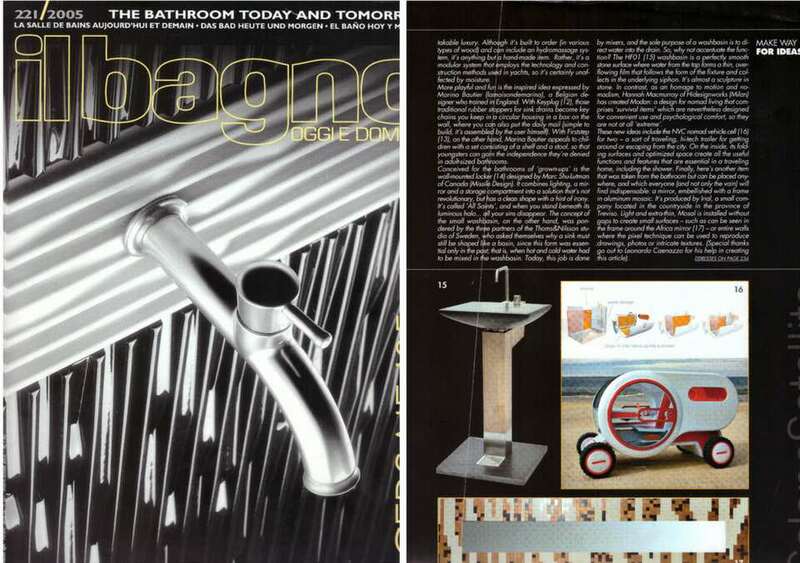 For the occasion of the exhibition “Avverati” dedicated to ten years of the Salone Satellite, the magazine Il Bagno presents a section entitled “Move the accent to the bathroom”. 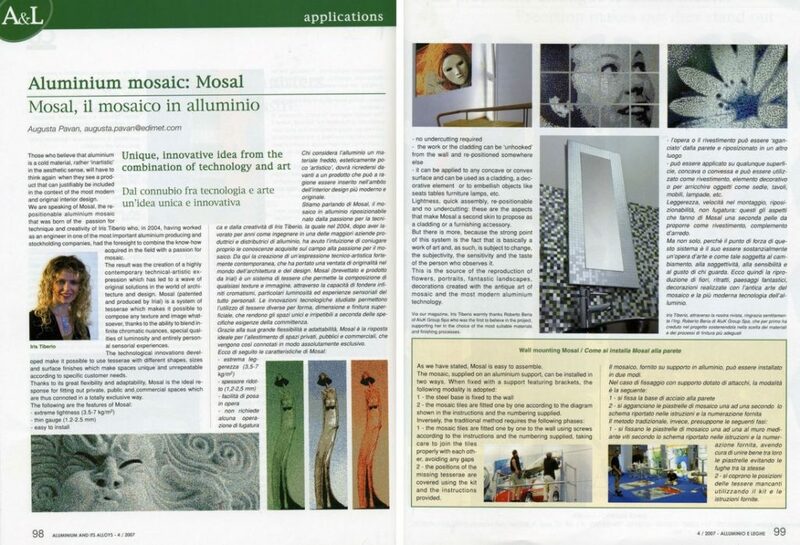 Among the design products that moved from the Salone di Milano to the market, the magazine also mentions Mosal, the aluminium mosaic by Irial. 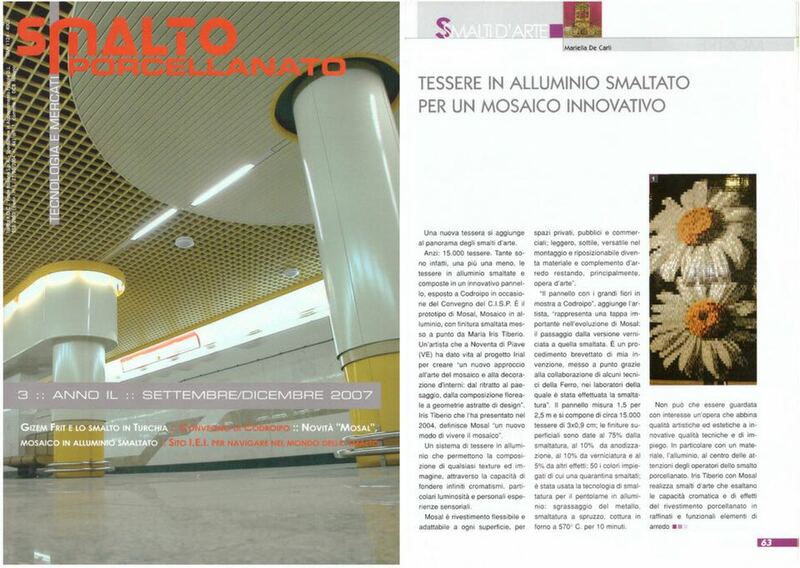 The magazine Smalto Porcellanato in the Art Enamels section published a detailed profile of Mosal, the aluminium mosaic with enamel finish by Iris Tiberio, who defined “a new way of experiencing mosaics”. 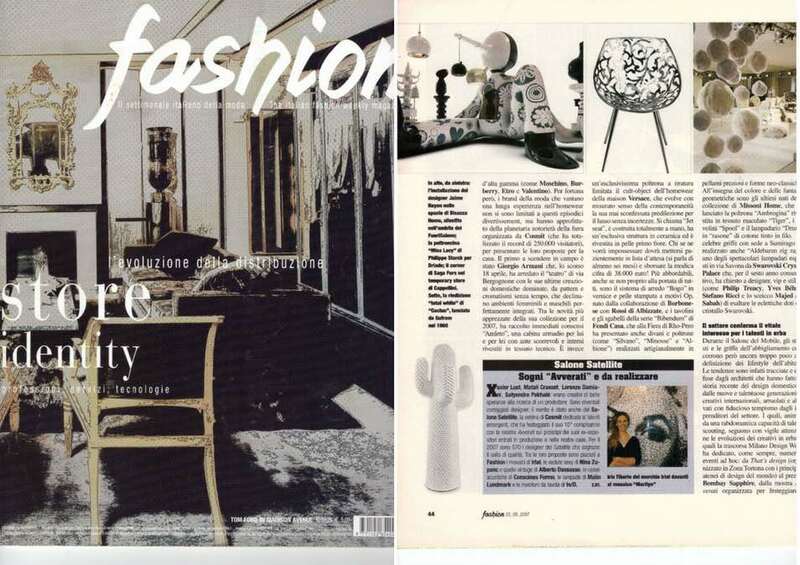 Fashion, the Italian weekly fashion magazine, for the occasion of the Settimana del Mobile di Milano published a section entitled “The thousand lights in design”. Among the most successful designers and companies at the Salone Satellite, the magazine inserted Iris Tiberio and Irial, participating with an artistic mosaic in aluminium dedicated to Marilyn Monroe. 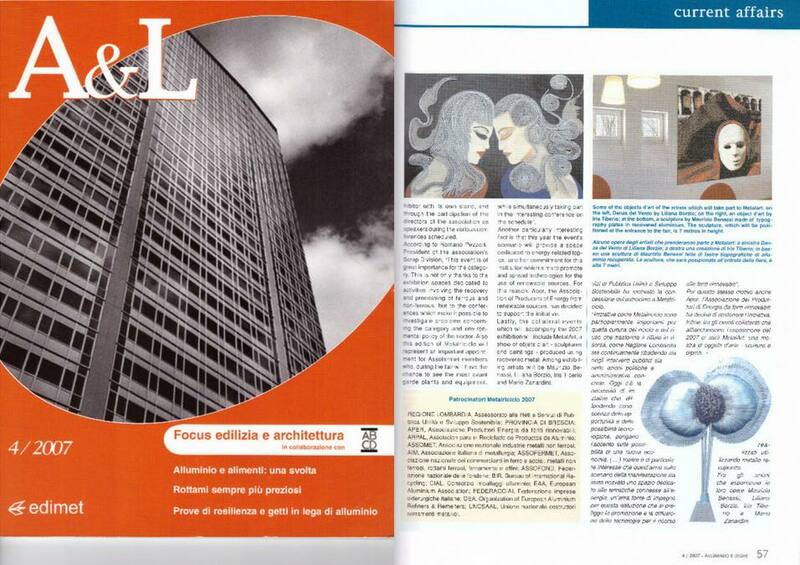 The magazine A&L – Alluminio e Leghe dedicated an article to Mosal, the patented repositionable artistic mosaic produced by IRIAL, able to give an artistic soul to aluminum. Thanks to its great flexibility and adaptability, Mosal is ideal for setting up private, public and commercial spaces, which are characterized in an absolutely exclusive way. The magazine A&L – Alluminio e Leghe presents the trade fair Metariciclo 2007, organized by the Regione Lombardia and several sector associations, cited Irial among the participating companies with their artistic mosaic created entirely in aluminium sheets dedicated to the Carnival of Venice. The catalogue for the 10th edition of Salone Satellite, scheduled April 18 – 23, 2007 at the Milan Rho Trade Fair and curated by Maria Griffin Wilshire, published an article profiling Irial, the creator of Mosal, a new type of mosaic combining art and technology. 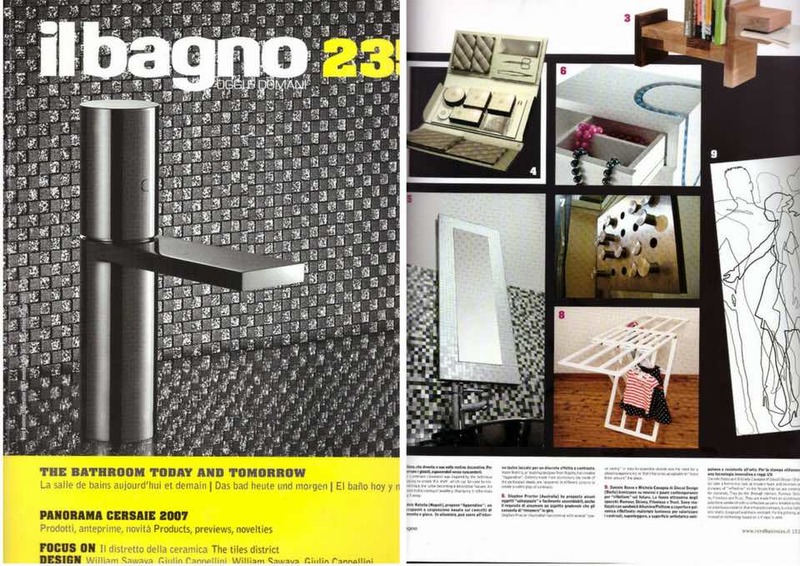 Il Bagno magazine dedicates a special section to the Salone Satellite in Milan. This is an important occasion for young designers to present themselves to potential investors and industrial companies. The aluminium mosaic by Irial was among the highlighted ideas.